Acknowledge the people who love you by sending this Healthy Treat Gift Basket for Caring Father and make them realize their worth in your life. 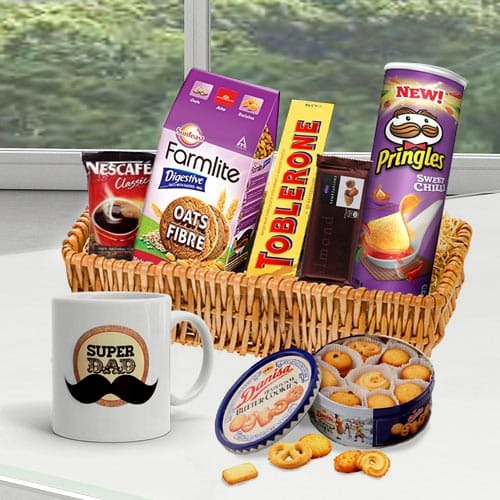 Delight your loving father with this fantastic Basket of goodies which is teamed with an Imported Danish Cookies, a Cadbury Temptations Almond (Net Wet.-80 gm), a Toblerone (Net Wet.-50 gm), a Pringle Chips, a Dad Coffee Mug, an Oats Digestive Biscuit and a Pouch of Rs.20 Nescafe. This generous assortment of delicious goodies is presented in a cane Basket.